"How far will he go?" Sony Pictures has released another new red band trailer for Louis Leterrier's The Brothers Grimsby, featuring even more crazy footage from this upcoming comedy starring Mark Strong and Sacha Baron Cohen as brothers that must team up to stay alive. We've seen a whole bunch of trailers for this over the last few months, including two full-length trailers already, so why not one more. The full cast includes Penélope Cruz, Isla Fisher, Rebel Wilson, and Scott Adkins. I'm enjoying whatever they keep showing us from this, hoping it's as funny as it looks. Sacha Baron Cohen looks to be doing some of his best character comedy work since Bruno and Borat. And I always enjoy seeing Mark Strong. Have fun. See the other trailers for The Brothers Grimsby: the first + second teasers, and first full / second full trailer. A new assignment forces a top spy (Mark Strong) to team up with his football hooligan brother (Sacha Baron Cohen) and go on the run. 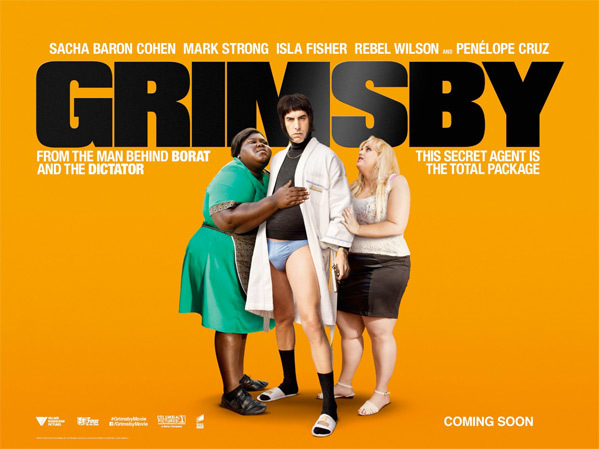 The Brothers Grimsby, originally titled simply just Grimsby, is directed by French filmmaker Louis Leterrier (of The Transporter, The Incredible Hulk, Clash of the Titans, Now You See Me previously). The screenplay is by Sacha Baron Cohen & Phil Johnston, from an original draft by Peter Baynham. Also featuring in the ensemble cast: Annabelle Wallis, Isla Fisher, Penélope Cruz, Rebel Wilson, Ian McShane, Scott Adkins, Rory Keenan, Gabourey Sidibe and Tamsin Egerton. Sony Pictures will release Leterrier's The Brothers Grimsby in theaters globally starting on March 11th, 2016 this spring. In? The role of a lifetime for Cohen. I genuinely can't believe how bad this looks or how anyone could read the script and think it's funny. What is Mark Strong thinking, this is just so embarrassingly lame. uggh... I love Cohen but this isn't really doing it for me. I'll wait for some real reviews to trickle in. Sacha Baron Cohen, Rebel WIlson, and Ian McShane. The unholy trinity of bad movies. Borat was brilliant satire, Bruno was good. The rest is... Ian McShane was only good in Kung Fu Panda and John Wick, which is saying a lot! Rebel Wilson.